More than 1.5 million such posts have now been written and shared among the 230 million English-speaking members according to LinkedIn, with more than 100,000 original posts published every day. On desktop, LinkedIn users are no longer able to access Pulse as a standalone feature from the dropdown menu under ‘Interests’ in the top navigation. However, you can view and follow recommended Influencers, Channels and Publishers here. Instead, LinkedIn is encouraging people to use the search box to discover relevant influencers and posts (in the same way you’d seach for a person or a company). Trending articles are now identified algrithmically and are pulled directly into individuals’ regular newfeeds where relevant. Mobile users can download an app to receive trending Pulse posts. Why did LinkedIn expanded its publishing platform? LinkedIn aims to position itself as a market leader in delivering not just relevant, but personalised, business news to its users, now aggregated from its own organic content as well as a wide range of online news sources and established influencers. It has previously stated that its goal is to be “the definitive professional publishing platform – where all professionals come to consume content and where publishers come to share their content”. Despite its awesome content marketing potential, the LinkedIn publishing platform is still relatively new and understanding what makes a post on the platform perform well is a bit of a grey area, particularly as the platform has now integrated Pulse – its news aggregation feature that showcases trending articles (now only available as a mobile app) – into its standard newfeed algorithm. So why use it? Note that while you can currently only publish as an individual, not as a company, it’s still possible to use it as an amplification platform for your company’s brand messages. Posting on LinkedIn allows you the potential to reach a professional audience of around 230 million in English speaking countries. But what really sets LinkedIn apart from other social networks is user intent. While users generally spend less time on there overall than, say, Facebook or Twitter, that time is likely to be spent focused on a professional or business goal; they’re actively looking for insights, advice or solutions to enhance their business or career (rather than, for example, stumbling across it on Twitter or you having to entice them to click on a link in your newsletter). That’s in addition to the slice of audience who have already previously engaged with you by following or connecting with you. According to HubSpot, LinkedIn generates a visitor-to-lead conversion rate of about 2.74%, which is around three times more than that generated by Facebook and Twitter. As well as the potential to bring your content to the attention of a relevant, receptive audience, the platform has an intuitive, easy-to-use interface, automatic promotion mechanism (your Connections and Followers are notified whenever you publish something new) and in-built analytics; plus your content will be searchable both within LinkedIn and search engines. Mistake 1: It’s all about me! Yes, LinkedIn posts are primarily for enhancing your professional reputation and increasing exposure for your brand, but you need to offer readers something of value. Demonstrate your industry knowledge and expertise by sharing your insights, observations and experiences. 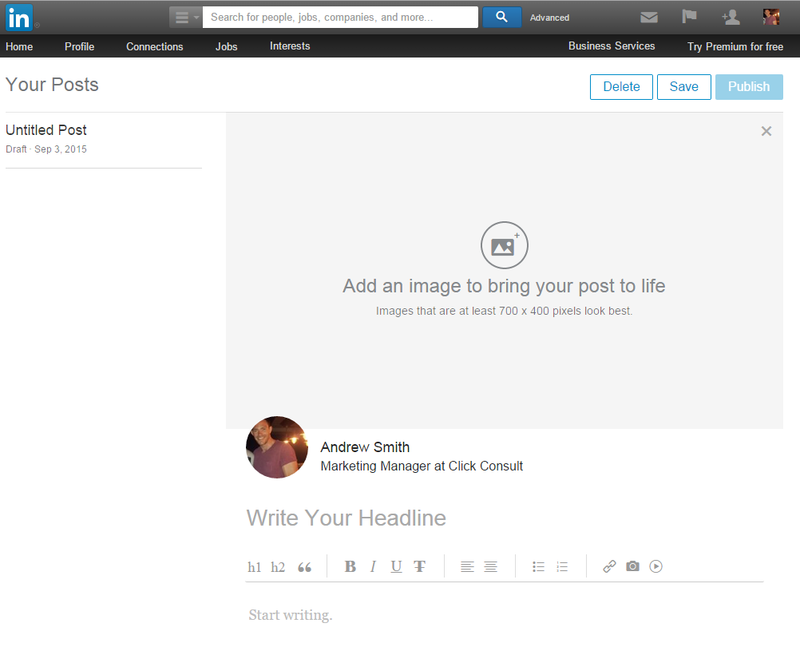 LinkedIn’s publishing interface is really user-friendly and is WYSIWYG (what you see as you’re writing is how the post will appear when live). If you already blog, you’ll be familiar with the main elements to pay attention to. Aim for 40-49 characters long and strike a balance between making it catchy and ensuring it’s clear what your post is about. Research has found that ‘how to’ and list posts perform better than those which pose a question, so bear this in mind when coming up with your headline. Follow web content best practice in terms of break up blocks of text with subheadings, bullet points, images, etc. People tend to scan a webpage before deciding whether to read on and long blocks of text can look daunting and off-putting. What do you want your readers to do after they’ve finished reading your post? Aim to keep your readers engaged by encouraging discussion and interaction, which creates and grows relationships and build trust. You can add keyword tags to each post so that LinkedIn can index your post correctly and effectively, and users can find it when they perform a relevant search. You’re limited to 3 tags, so choose wisely. The work doesn’t stop after you after you’ve hit ‘publish’. Your LinkedIn posts automatically appear in the newsfeeds of your Connections and Followers and become part of your profile, but there are other ways you can maximise engagement with your posts. Keep an eye on comments, likes and shares to monitor the success of your posts; identify which topics and styles are generating the most interest and interaction and do more of what’s working. Also look at the times and dates that bring most success. Repurpose. A top content marketing strategy in its own right, this means taking material from your original post and presenting it in a new way. For example, turn a blog into a top tips feature or Q&A; or go into more depth on points you’ve highlighted in an infographic. Promote with teaser text. Use LinkedIn to publish a brief intro to an older blog post, perhaps summarising the key points or bullet-pointing the takeaways that encourages people to read more and link back to your site. Craft a unique headline with your LinkedIn readers in mind. Looking for guidance on your social media engagement strategy? Contact us today for more information. We’re bringing together some of the biggest names in search marketing at our Manchester-based conference later this month. Search marketing strategist Gino De Blasio, who speaks 5 languages and has lived across Europe, answers our questions about international content marketing.